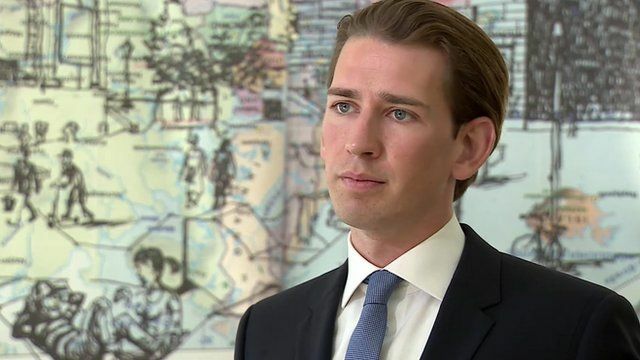 'EU asylum system isn't working' Jump to media player Austria's Foreign Minister, Sebastian Kurz, says the Dublin regulation, which is part of the EU's asylum policy, is not working. Europe violence as more migrants arrive Jump to media player There's been more violence in Europe as police in Hungary used tear gas to disperse migrants protesting at a reception camp on the Serbian border. German leader booed at migrant centre Jump to media player German Chancellor Angela Merkel has been booed by far-right protesters during a visit to a shelter for asylum seekers where she appealed for tolerance towards migrants. Hungary migrants protest at reception centre Jump to media player Police in Hungary use tear gas to disperse migrants protesting at a reception camp on the Serbian border. Austria's Foreign Minister says the Dublin regulation, which is part of the EU's asylum policy, is not working. The system means asylum seekers must make their applications in the first EU country they reach. Sebastian Kurz says passport-free travel between most European states could also be in danger.